Everybody suspects that there's going to be some line-item vetoes when Gov. Bill Richardson takes action on the budget bill and other bills the Legislature sent to him last week. But after a recent veto message from California Gov. Arnold Schwarzenegger, New Mexico lawmakers might want to read any message from Richardson very carefully. 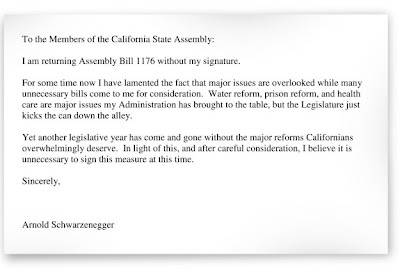 To find the hidden message in the Arnold veto, look at the first letter of each line starting with the paragraph that begins "For some time ..."